Greetings from The 88 Project! We are bringing you news, analysis, and actions regarding human rights and civil society in Vietnam during the week of October 30-November 5. Environmental and labor activist Hoang Duc Binh’s investigation period has ended; he will be charged under Article 258 for “abusing democratic freedoms.” Police have targeted former prisoner of conscience Bui Thi Minh Hang and several Catholic priests and locals in southern Vietnam. Several international human rights groups and scholars have called for Vietnam to release political prisoners ahead of the APEC Summit on November 10. In the news, there is an analysis of a new bill in Vietnam and of Trump’s impending visit to Asia. November 2 marked one year since doctor and blogger Ho Van Hai was arrested; he is still in pre-trial detention. Finally, please check out and share Human Rights Watch’s interactive list of fifteen political prisoners. A Vietnamese activist arrested after protesting the government’s handling of the Formosa toxic spill will be tried for “abusing democratic freedoms to infringe upon the interests of the state,” and could face between two and seven years in jail. Hoang Duc Binh is the vice president of the independent organization “The Labor Movement of Vietnam” and a member of “No-U Saigon,” a group that protests China’s sweeping claims on the South China Sea. Binh was arrested after organizing protests over the government’s response to the April 2016 waste spill. Binh was kidnapped and arrested on May 15, 2017. He was transferred to B14 Detention Center in Hanoi in June 2015, and has not been able to receive supplies from family. His investigation was completed on 10/30. November 2 marked one year since Ho Van Hai’s arrest. The doctor and blogger was arrested on November 2, 2016 for content posted online. Hai reportedly wrote on the April 2016 Formosa environmental disaster. He is still in pre-trial detention and faces up to 20 years in prison. A former prisoner of conscience, land rights activist Bui Thi Minh Hang, was taken from her cousin’s home for police interrogation for several hours this week. Police took away her smartphone and money and would not tell her the reason for her detention. Hang has been targeted repeatedly in recent years for her involvement in peaceful protests against China and was arrested in 2014 for “causing public disorder.” She was sentenced to three years in prison and was released in early 2017. Two priests who have worked to help fishing communities win redress from the Formosa Plastics Group for the April 2016 toxic spill were surrounded and threatened by a mob of people waving red flags, in what the clergymen and rights group said is part of a broad pattern of government-supported abuse. 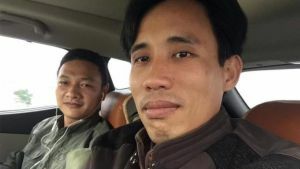 One of the priests, Dominic Pham Xuan Ke, told reporters that he and fellow priest Joseph Nguyen Ngoc Ngu had come to the Diem My Commune People’s Committee office in the spirit of working to solve problems, but then found themselves beset by the mob. “They said the group had gathered spontaneously, but that’s impossible,” said Father Ke. A retired Vietnamese propaganda official told reporters that the Red Flag groups were most likely given approval from governmental authorities. On November 1, at the commemoration ceremony in southeast Vietnam for Ngo Dinh Diem, the former South Vietnamese President who was assassinated during a coup in 1963, attendees were met with police resistance and openly attacked by pro-government thugs. Anna Nguyen Huyen Trang, a Catholic reporter working for the Redemptorist-run news blog Good News for the Poor said she was assaulted and injured. Civil Rights Defenders released a statement calling on Cambodia, Burma, and Vietnam to end their crimes against and repression of journalists in those countries, citing the lengthy prison sentences given to citizen journalists Tran Thi Nga, Nguyen Ngoc Nhu Quynh, and Nguyen Van Oai this year in Vietnam. They released the statement in conjunction with The International Day to End Impunity for Crimes Against Journalists, November 2. Human Rights Watch has called for the release of political prisoners in Vietnam ahead of the APEC summit on November 10. They cite an increased crackdown on activists and journalists this year and list 105 people currently in prison for their political or religious beliefs (this does not include people in pre-trial detention). Read about the cases of 15 highlighted Vietnamese political prisoners on their website. Please share Human Rights Watch’s interactive list of 15 political prisoners to raise awareness about their situation and advocate for their release.